British poet and academic Malcolm Guite will deliver the Laing Lectures this year. 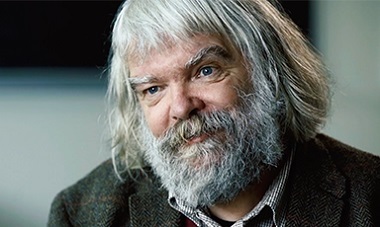 I imagine it was a bittersweet experience for Malcolm Guite when he was asked to deliver Regent College’s Laing Lecture Series this year. Last year, Regent College was honoured that Dr. Lamin Sanneh – a Gambian scholar and leading thinker in World Christianity – had agreed to come to Regent as our 2019 Laing Lecturer. 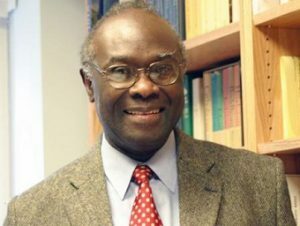 Sadly, Dr. Sanneh passed away on January 6, 2019 at the age of 76, survived by his wife, son and daughter. Christianity Today published a collection of reflections on Sanneh’s remarkable life and career from a number of friends and fellow scholars. Lamin Sanneh passed away January 6. As we continue to grieve this loss, we are grateful for Dr. Malcolm Guite, who has agreed to serve as our new 2019 Laing Lecturer. His lecture series will run from April 9 –11. Please note that these are not the same dates that Dr. Sanneh had planned on delivering his lectures. Dr. Guite has become one of the chief imaginations in today’s church, having published numerous popular works of theology, literary analysis and poetry. He has toured widely in Europe and North America, lecturing everywhere from community churches to St. Paul’s Cathedral in London. From the first moment that he proclaims the kingdom of God, Jesus appeals to our imagination. He makes that appeal through the parables of the kingdom, the paradoxes of the gospel, the enigmatic and beautiful signs he gave in his miracles and in those moments when the heavens open and the ordinary is transfigured. In the gift of faith, and in Christ himself, we glimpse more than we can yet understand: Our imagination apprehends more than our reason comprehends. This is not to say that the gospel is in any way “imaginary” in the dismissive sense of “unreal” or “untrue.” On the contrary it is so real and so true that we need every faculty of mind and body, including imagination, to apprehend it. In an age of linear, one-level readings of the word and the world, we need to recover confidence in the baptised imagination as a truth-bearing faculty. At the 2019 Laing Lectures, hear Dr. Malcolm Guite make the case for a faith that is imaginatively grasped and imaginatively proclaimed. Consider in turn Christ’s appeal to the poetic, the moral and the prophetic imagination. 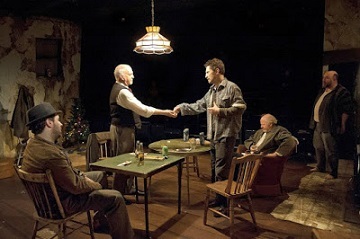 ‘The Seafarer’ at Pacific Theatre. In fact, within a couple short years he had built such a remarkable network of relationships here that he ended up on the Pacific Theatre board, as an advocate and “cheer-leader” who is also very smart about leadership and most other things. There are other places where this could have worked, but we’d have been different. I’d have been a different person; I’d have built a different theater. But this place drew me. I’ve often wondered what it would have been like if we’d planted someplace else. But this is the best soil. What did I mean by my cryptic comment about “the best soil”? So this morning in an email I tried to make sense of that. Go here for what Ron wrote. The Metro Vancouver Alliance (MVA) has had strong support from a range of faith (mainly Christian) groups over the past few years, but they clearly feel there is room for more growth, so they’re launching the MVA Faith Caucus February 19 at St. Mary’s Catholic Church. What’s on the menu? We will feed you lots of good stories about the meaningful impact that broad-based faith organizing has had on Canadian society. (There will also be food, of course!) Come with an appetite to relate with one another, and we promise that you will walk away with more than enough material for a great sermon or reflection! Metro Vancouver Alliance is a broad-based alliance of community groups, labour, faith and educational institutions working together for the common good. Broad-based community organizations operate on the principle of ‘power before program.’ In other words, they build strong relationships amongst diverse groups in the community. Those groups then come together to listen to their members’ concerns and to agree on issues that can be worked on together. This ensures that the alliances are sustainable over the long term and that members work on those issues that concretely matter most to them. Members develop leadership skills and learn “the art of politics” through active engagement and participation. The more than 50 member organizations are divided into four categories: faith groups (26 strong), labour unions and locals, community groups and educational groups. Go here to see the membership list. Of the three sponsoring organizations, two are denominations – the Anglican Diocese of New Westminster and the Roman Catholic Archdiocese of Vancouver. The other sponsor is Vancity. 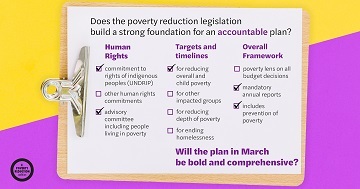 Government of British Columbia has kept its promise to MVA leaders to legislate a poverty reduction strategy! In 2017, John Horgan and Andrew Weaver stood before 800 MVA leaders and committed to legislate a poverty reduction strategy. This week, the legislation passed unanimously! I had a post about that meeting on Church for Vancouver.